A big part of me is being a mommy. I have a four year old son and a two year old daughter. I am pretty proud to say that I trained my daughter to use the potty in about 2 days last weekend. I took 2 days off completely to devote to her and the training. She is thrilled that she can use the potty. We still have the challenge though of staying dry through nap time and night time. I want to limit the use of pull ups if I can. From my first experience with Johnny, I found that the pull ups just delayed the whole potty training process, not to mention the cost, so for Mia, I skipped the pull ups and went straight into underwear for the training which worked. Yes of course there was plenty of messes that first day, but it paid off. But what to do during naps and night time when she doesn’t quite have the ability to hold it while asleep? My neighbor who also has a 2 year old daughter, mentioned to me that Target carries cloth training pants that are thick like cloth diapers. So off I went to Target, and I found them. They came in a pack of 3 at about $8, in the most blandest colors of pink, yellow and orange. Then I spotted a package of bright and colorful My Little Pony underwear. Mia loves the ponies and it was about $10 for a pack of 7. Part of the reason Mia’s initial potty training went so well was that she was excited to wear all the cute underwear I got her which featured Disney Princesses. Why couldn’t these pony ones come in a training pant? I decided to put my DIY abilities to work and convert them to training pants myself. When the kids were babies people gave me a bunch of cloth diapers, which I used as burp cloths sometimes, and I still had a huge stack of ’em. My approach was fairly straight forward. 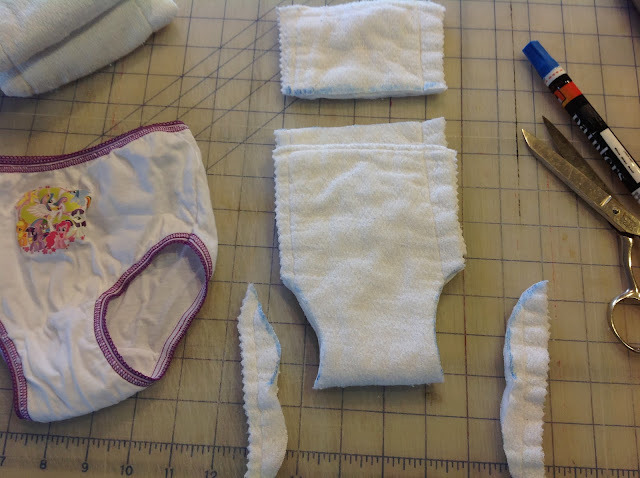 Cut out inserts of the diapers and sew them into the already made, cute as a button, underwear. 1. I first cut off the left and right side of the diaper, so that only the middle thick part was left. I used pinking shears which worked well. 2. Fold them over and position them into the underwear on the inside. The diaper will be longer than the underwear. 3. With a marker draw out the curves of the leg holes and mark where you will be cutting off in length. 4. Cut off where you have marked. If I had to do this over again, I would have added a step and sewn closed my cutoff areas before I sewed them into the underwear to prevent fraying that occurred. 5. Turn the underwear inside out and pin your diaper piece in place. 6. 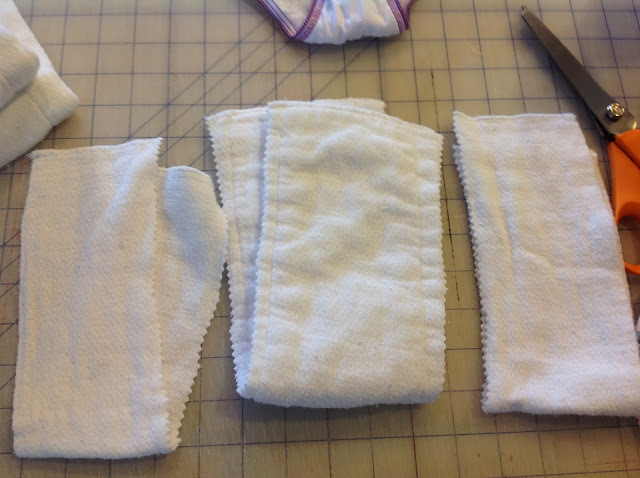 Using a zig zag stitch, sew the diaper insert in. This is a little tricky with all the pins and the small size of the underwear but just go slow and be careful. and Ta-daaaaa! Easy peasy training pants. So as soon as I finished I showed little Miss Mia her new underwear and she was super excited! I got a “Wow! I like it!” and then she grabbed a pair instantly changed into them all by herself in the middle of the living room. Now that makes me a happy Mama. Now I have read in other tutorials that you can also add a layer of material called PUL, which will give it a waterproof barrier. I think I might try this on the next pair. I am definitely trying this , I too bought training pants and they are indeed boring to little kids One time I tye- dyed some just to make them brighter! Thanks, now to make them water proof.